Heat oven to 450°F. 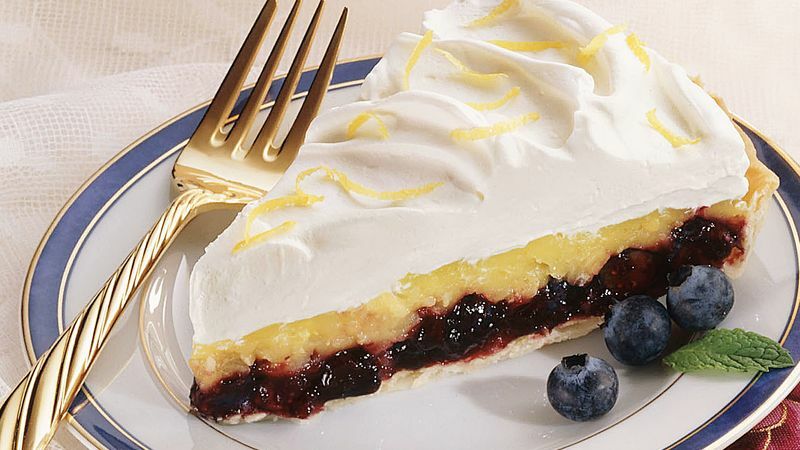 Make pie crust as directed on box for One-Crust Baked Shell using 10-inch tart pan with removable bottom or 9-inch glass pie pan, but do not prick crust. Trim edge if necessary. Bake 9 to 11 minutes or until light golden brown. If crust puffs up during baking, gently press crust down with back of wooden spoon. Cool while making filling. In 2-quart saucepan, mix pudding mix, granulated sugar, 1/4 cup water and the egg yolks until smooth. Stir in pineapple, 1 1/3 cups water and 1 teaspoon lemon peel. Cook over medium heat, stirring constantly, until mixture boils. Remove from heat; cool slightly. In small bowl, mix blueberries and preserves. Spread in bottom of cooled baked shell. Spoon pudding mixture over blueberry mixture. Refrigerate until cold, about 30 minutes. In another small bowl with electric mixer, beat whipping cream, powdered sugar and vanilla on high speed until stiff peaks form. Spoon or spread over pudding mixture; sprinkle with 1 1/2 teaspoons lemon peel. Serve immediately. Store in refrigerator.